Cheat day foods. Most of us have them, right? Ever since we put the holidays behind us, I've done exceptionally well with my food choices. 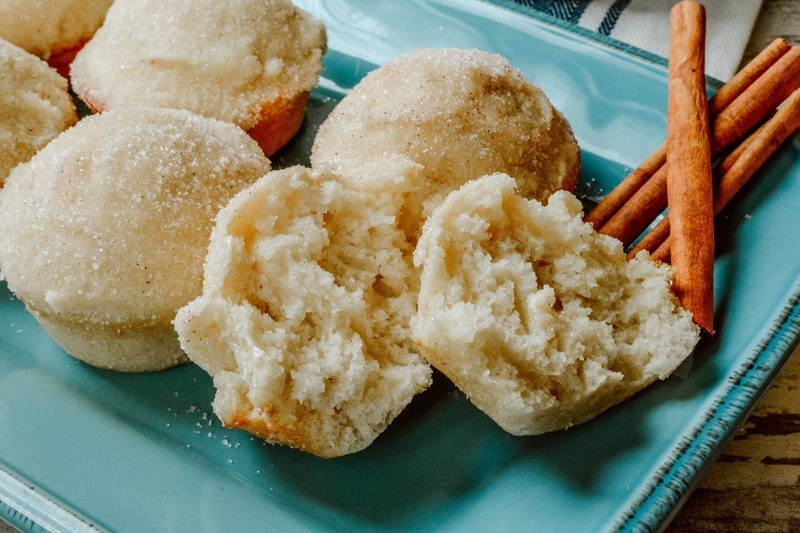 But, sometimes a girl has to splurge, so this week I thought I'd turn my oven on, which hasn't seen much action in a month, dusted off an old favorite recipe, and went to work making a batch of super simple cinnamon sugar breakfast muffins. I love baked goods but sometimes I don't feel like putting forth a lot of effort it takes into making them from scratch. That's where this recipe has earned its spot in my favorites because it doesn't require more than 2 bowls and I don't have to pull out my bulky stand mixer, or even my handheld mixer for that matter. 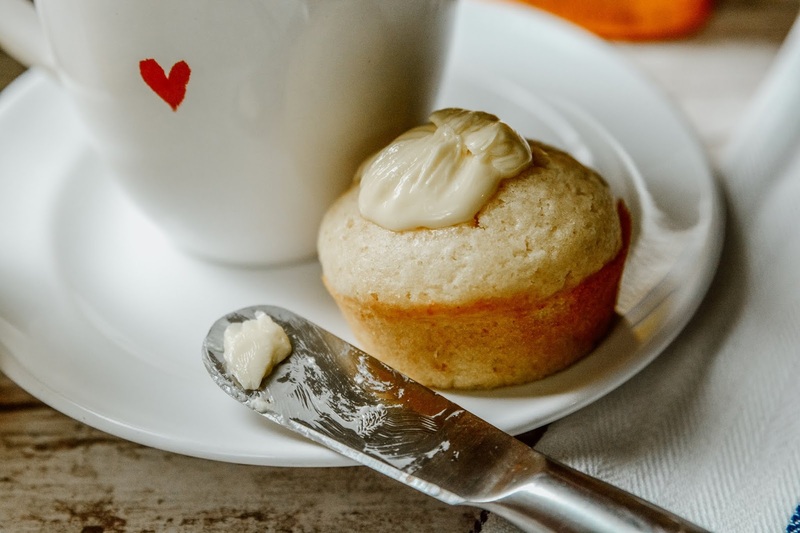 The recipe calls for basic ingredients that you should already have in your pantry, so these can be made anytime you need to satisfy your sweet tooth. All you need is a whisk and a wooden spoon to whip the batter into shape and you're good to go. I'm not lying when I say it's so simple! The end result is a fluffy, yet a little chewy breakfast muffin that can be endlessly customized to suit your fancy. You can leave it basic and eat them right out of the pan (once they've cooled off a bit, of course), or mix in some seasonal fruits, chocolate chips, or walnuts. Whatever you like in your muffins is fair game here. I tore this recipe out of an old Family Fun magazine over 12 years ago and have made it countless times over the years. 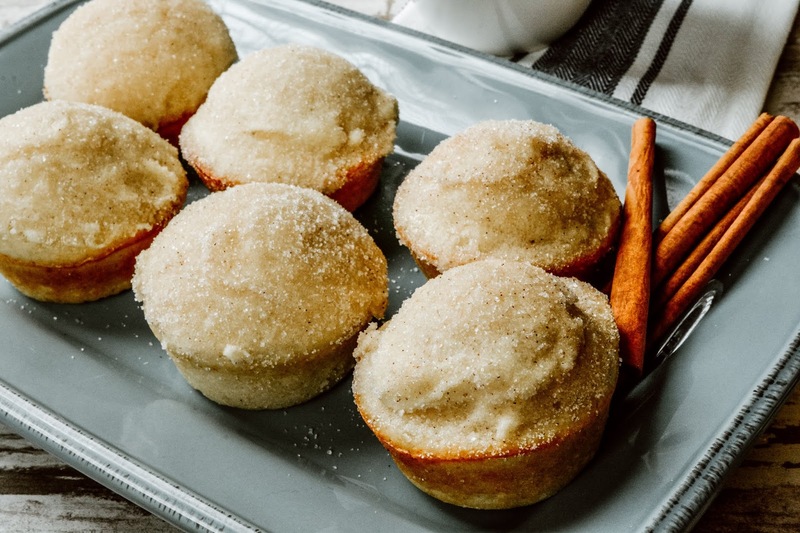 It's still one that my family gets excited for every time they see a brimming platter of these muffins sitting out on the counter waiting for them to devour. While I've tossed in so many mix-ins into the batter before, our all time favorite way to dress them up is with a cinnamon sugar topping. 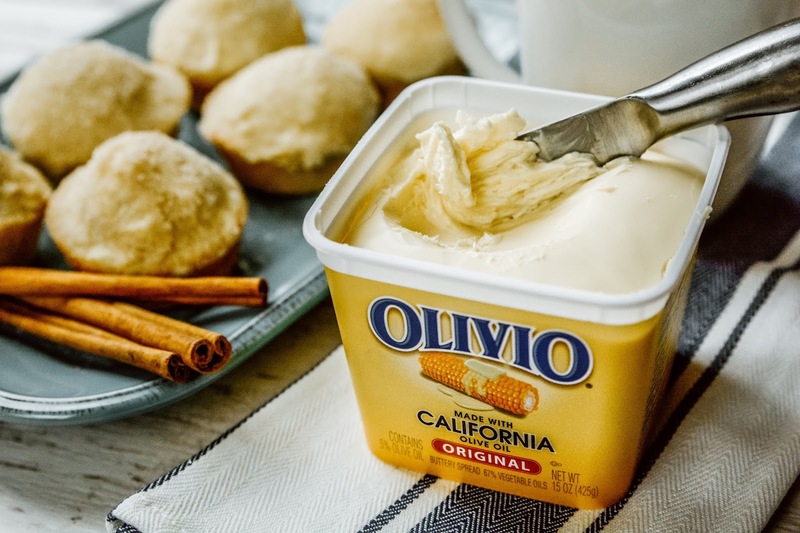 Normally I would just slap some butter over the tops, then dip in a cinnamon sugar mixture, but for the past few weeks I have been enjoying using Olivio, a rich and creamy buttery spread. 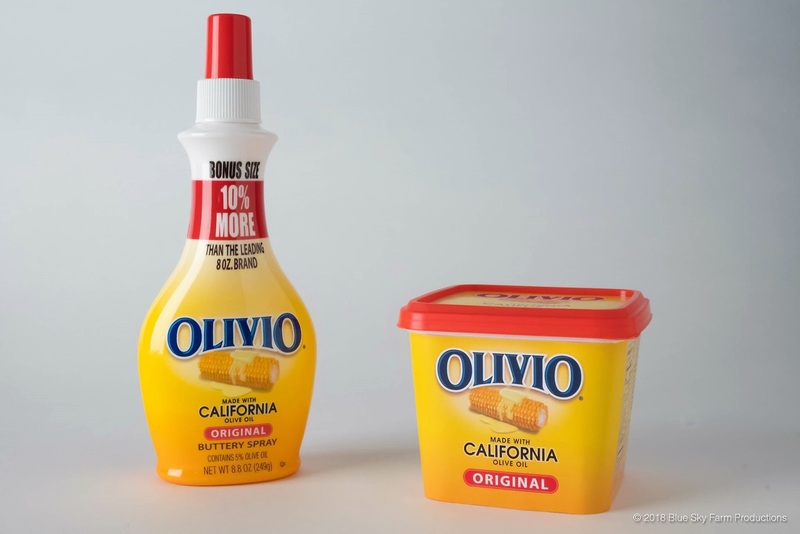 Olivio spreads offer a line of healthy alternatives to butter and margarine. 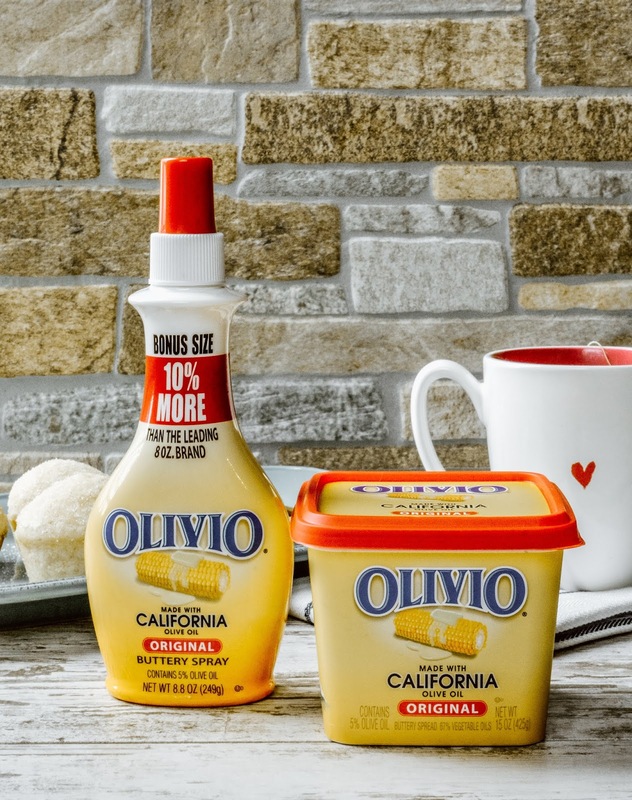 Each buttery spread and spray is made with the goodness of 100% California olive oil, with zero cholesterol, less fat and fewer calories than butter. Which means I can pop a little over the top of my muffins and not feel as guilty about the indulgence. 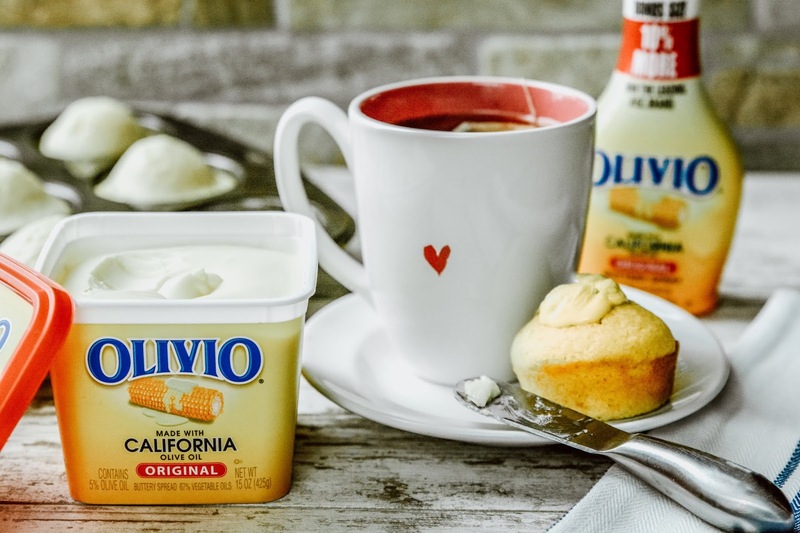 Olivio comes in a spreadable solid, which is perfect for baking, sautéing, or just slathering across a hunk of bread or your favorite breakfast muffin. They also offer a convenient buttery spray, which is great for spritzing over some steamed veggies, freshly popped popcorn, or anywhere you want to mist on a hit of buttery flavor. Best of all, it has zero calories per serving, so it's a wonderful option for those of us who are still sticking to our weight loss resolutions for this year. Preheat oven to 375 degrees F. Grease the bottoms of a standard sized 12 cup muffin tin. Pour the flour, sugar, baking powder, salt and nutmeg into a large mixing bowl. Combine with a whisk. In a medium-sized bowl, whisk the egg until it is frothy. Whisk in the milk, melted butter, and vanilla. Make a well in the center of the dry ingredients. Pour the liquid into the well, and using a wooden spoon, mix the batter until it's evenly blended. Spoon into the prepared muffin cups, filling each cavity 2/3 of the way full. Bake the muffins in the center rack for 15 minutes, then rotate the pan and bake for an additional 7 minutes. Transfer the muffin pan to a wire rack until muffins are cool enough to touch, then remove them from the cups. Mix the sugar and cinnamon in a small bowl. Spread desired amount of Olivio over tops of muffins, then dip into the cinnamon sugar mixture to coat. Serve immediately, or store in an air-tight container in the refrigerator for up to 2 days. Full nationwide distribution of Olivio started this month, so be sure to look for it at your local retailer in the refrigerated section. If you try this recipe, be sure to snap a pic and tag me on social media (marison459 on Twitter or Instagram) and let me know what you think! What's your favorite recipe for cheat day? Yes, we love our buttery spreads like you wouldn't believe. Do you not put a pat on your cornbread muffins at least? I do love it on my cornbread, but will sometimes opt for a little honey instead. No, I don't have butter or margarine at all in da house :) I used to put vitaminised margarine into my seeds spread, but stopped after discovering coconut oil. Jason still isn't much of a coconut oil fan, so I don't use it much here lately. I have switched to avocado oil, but that doesn't come in a solid form, just liquid, so I only use it for baking and the occasional frying. Those sound so amazing! That's the kind of thing that makes me feel like I had dessert for breakfast. I haven't heard of the spread. I'll have to give it a try. The muffins look so good! I hope you do try it Rosey. I used it in our mashed potatoes last night and it made them soooo good! I love cinnamon sugar flavored things so this is right up my alley. They are really tasty Mary! Wooow, this looks amazing! I think my family would go crazy for it. It also looks pretty easy to make. This does look easy! I should make some. My boys would gobble them up! I like anything chocolate. I wish I didn't. The healthier stuff is so expensive. Oh wow. Those muffins look so delicious! I wish I could wake up to a breakfast like that. Love the spread too. Haven't tried Olivio yet. That sure looks like a healthier substitute for butter! 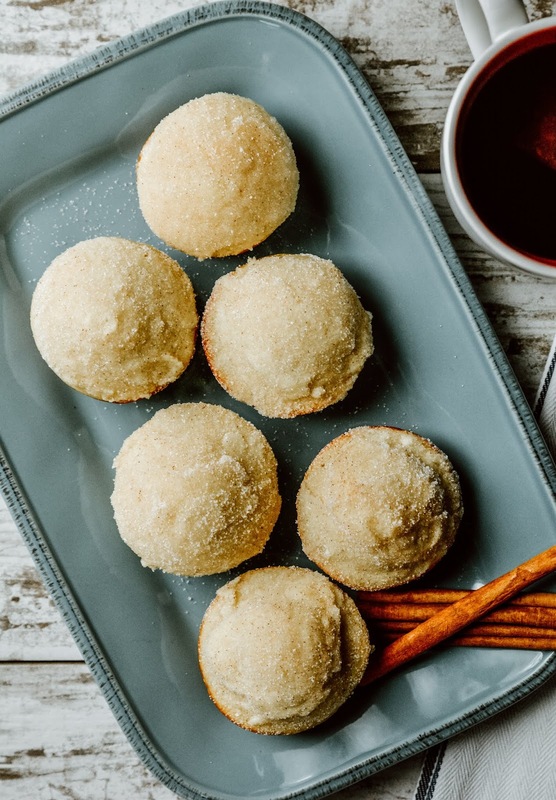 I'm a sucker for Cinnamon Sugar Breakfast Muffins. Olivio makes it extra special. It looks so yummy and tasty! I would like to try it soon. I can imagine a cup of hot tea coupled with freshly baked muffins spread with this lovely butter.. yuuuum! This looks the perfect bed and breakfast item on a beautiful Sunday morning. I will definitely be making this. Thannnnkkk you!